Heading into the brutal tail end of winter, we’ve found that we have warm kitchens and home-cooking on the brain. The next time you have a free afternoon, we recommend heading to your local library or a bookstore to spend some time thumbing through the cookbook section for inspiration. A great collection of recipes does more than just help you make dinner. It also tells you a story, or perhaps many stories—about different cuisines and cultures, about the author, and maybe even about yourself. You don’t necessarily have to be a great cook to enjoy this activity, by the way. In an essay about the pleasure of reading recipes, Bee Wilson describes recipes as “stories of pretend meals” that have a narrative arc. “Every recipe, whether we cook it or not, offers a vision of the good life, and a way of tasting food in your brain,” she writes. She especially enjoys reading historic cookbooks, which she likens to adventure stories. Modern cookbooks too can have the same effect, especially when they’re about places you may never dine in person. There are cookbooks that can transport you to another place, like My Life in Paris with David Lebovitz, an expat who rhapsodizes about French chocolate shops and farmers’ markets even as he longs for the American peanut butter he left behind. 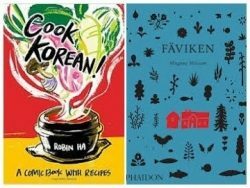 Robin Ha, a cartoonist, uses colorful hand-lettered comics to share recipes, family stories, and the history of Korean cuisine in Cook Korean. Sometimes a good cookbook can even help you through a difficult time in life, as when Judith Jones, who was Julia Child’s editor, wrote The Pleasures of Cooking for One, a cookbook she developed after the death of her husband. And don’t forget your own collection of recipes, whether they’re in a drawer or a box or a book—the dishes passed down from your parents and grandparents, that cake your neighbor likes so much, the splattered notecards you can never seem to find when you want to make soup or spaghetti sauce. As ISC President Kiran Singh Sirah wrote last November, every meal is a story that tells about “the traditions of our everyday lives—the foods, rituals, beliefs, and other cultural markers we use to express our values and identities.” Cooking is a kind of storytelling, and like all stories, it’s best shared with others. Stories in Motion is a regular feature in which ISC examines the fresh ways we see the power of storytelling at work in the world.